Today Senator Barack Obama visited Google as part of our Candidates@Google series. Unveiling an innovation agenda, the Senator emphasized the need to employ technology and innovation to solve the world's most pressing problems. He called for massive investments in climate-friendly technologies to help end America's addiction to oil and move towards a clean energy future. Transportation emissions comprise over 20% of the world's greenhouse gas pollution. To reduce carbon dioxide emissions and cut oil use, Google.org's RechargeIT project is advancing plug-in electric vehicle technology. This initiative aims to accelerate commercial adoption of plug-ins by demonstrating the technology, and by making grants and investments. 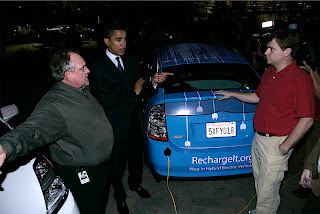 After Senator Obama's talk, our own Larry Brilliant, RechargeIT's Lead Engineer Alec Proudfoot, and Project Manager Kirsten Olsen demonstrated vehicles in Google's plug-in fleet. The Senator voiced keen interest in the government's role in encouraging widespread use of plug-ins. A clean energy future requires innovative technology, sound public policy, and changes in how we consume energy. Most of all, it requires leadership. We invite all the 2008 Presidential candidates to visit Google for a test drive. Update: You can watch the video of Senator Obama's speech here.